We’ve spent plenty of time talking about how flowers look great and are the perfect way to brighten up your office with their pretty colours and striking patterns. But one thing we haven’t talked about is how flowers can add a wonderful, natural scent to your office. So why not ditch the air fresheners and plug-in smellies, and opt for Mother Nature’s very own Febreze? Not only is this flower particularly beautiful, it also has a strong and recognisable fragrance. This is the perfect flower to place in an entrance or reception area as it will greet guests with a gorgeous perfume. Make sure to keep away from any soft furnishings or clothing as the pollen can stain, leaving an orange mark. The simple rose is possibly the most popular flower ever to bloom, and it’s not hard to see why. The beautiful flower comes in so many different variations, with colours ranging from deep red to hot pink to pure white. It’s not just the colour that can change from flower to flower, though, as you can find roses with completely different fragrances. Some will have a sweet musky floral smell while others will carry a fruity or citrus scent. These flowers are perfect for bathrooms or meeting rooms as they can be particularly compact while still emitting a brilliant perfume. The great thing about this striking orchid is that it smells as good as it looks. The pretty yellow flower gives off a delightful, fresh lemon scent. If you find that the strong fragrances of other blossoms can be a little too overpowering, this might be the perfect option for you. The subtle and bright perfume of the cymbidium orchid is ideal for just about anywhere in the office, but will work well in working areas where particularly strong scents can be a little distracting. The simple hyacinth is a pretty little flower that is particularly versatile when it comes to flower arranging. It can come in a wide range of colours, but is best known for its pretty blue/purple shade. This flower has a strong and pleasant perfume so they are great to use just about anywhere that you want to smell sweet and fresh. As our hyacinth arrangements come in simple and elegant designs, they would be ideal for desks and smaller places. This tropical looking flower has a striking appearance as well as a wonderful scent. These would be great to use in any kind of display as they look fantastic but will also give off a pleasant fragrance that will brighten up any room in the office. Why not try placing them on reception desks to provide a focal point? Obviously, we love flowers that come with their own signature scent, but sometimes it can be great to make use of blooms that are fragrance-free as some people can find the strong perfumes of flowers such as lilies and roses a little overpowering. By using unscented flowers in your office, you can ensure that everybody gets to enjoy them. For beautiful blooms that won’t smell, you can try hydrangeas, calla lilies, ranunculus or amaryllis. 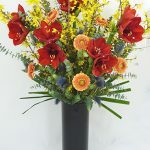 Here at Jungle World, we are floral experts, so whether you’re looking for corporate flowers that will brighten up an entrance way, fit in naturally on office desks or welcome guests into reception, we can help. For more information about any of our services or flower arrangements, please don’t hesitate to contact us today by calling 0208 968 8190 to speak to a member of our friendly team.